Hey y’all! I hope that you are having a great weekend! We just had to share our Fabric-Inspired Easter Eggs that were a part of It’s Overflowing’s Easter Egg Hunt last week! Our husbands would say that we have an addiction to modern quilting fabric, but we prefer to see it more as a large collection. Some people like beautiful shoes… we like pretty fabric! 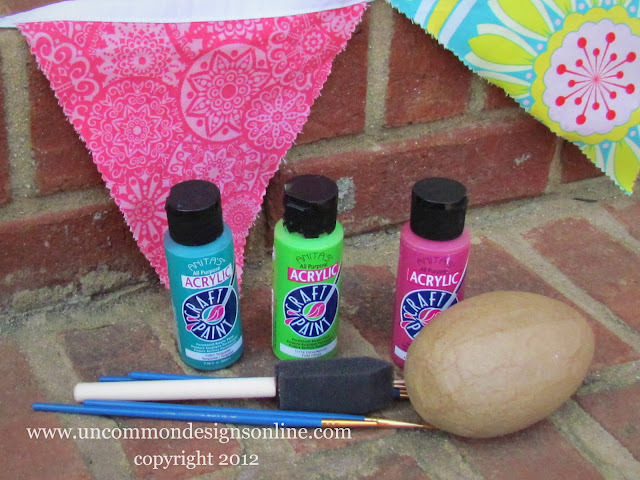 Since we love it so much, we decided to paint a few eggs that were inspired by this beautiful fabric bunting that we made last year! You may also choose to apply a layer of Modge Podge if you would like your eggs to be glossy like ours. Polka Dots: To make the polka dotted egg, I painted the background colors with a few shades of antique white craft paint and let it dry fully. You will then take a foam dot stamper brush, dip it in the paint and press the sponge lightly to make the dots. You may want to go over the dots with a regular paint brush to make sure they are filled in. Paint one side with the dots and let it dry and then do the other. Let dry and apply a coat of Modge Podge, if desired. Stripes: Determine how many colors you will use and how wide you want your stripes to be. You could draw the lines with pencil if that would help. Take a an angled paintbrush and paint a stripe and then apply the same color all around the egg. 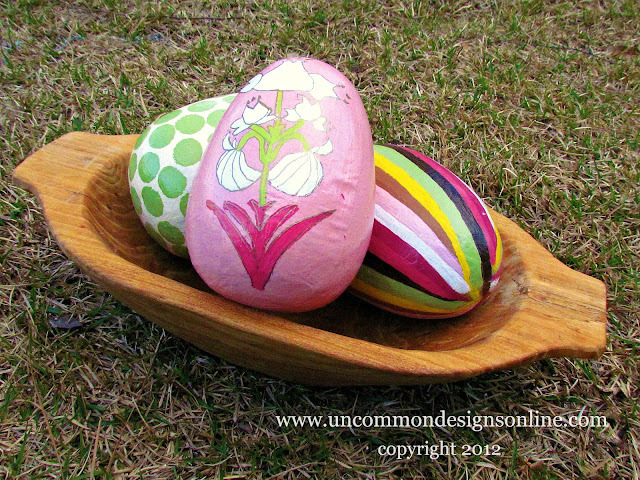 You may need to let the paint dry about halfway around the egg for each color. Let dry and apply a coat of Modge Podge, if desired. Free Hand: Paint the base coat color one or two coats and let dry completely. You will then draw the design on the egg. The key thing to remember is that it doesn’t have to be exact or perfect! I know mine isn’t, but it is still beautiful! Now, paint in the sketch. I used a metallic paint pen to go over the lines to bring out the design. Let it dry and add a coat of Modge Podge, if desired. If you love these, be sure and hop on over to see our Temporary Tattoo Easter Eggs…. ETSY Shop Update…The Bunnies Are Here! I love these so much! I think I may have to try this one myself! You ladies are so creative! Jessica you stole my line! 😉 Super Duper cute Ladies!! Love how easy and adorable these eggs are! Keep the amazing ideas flowing, I am loving them! I loved these when I saw these over at Aimee’s place, and I still love them! Great job, perfect for the holiday! Visiting from Blissful & Domestic Blog Hop. Love your projects. Following on GFC. I’ll be back Tuesday to party! What a fun idea! We are doing natural dye this year (hoping it goes well). Found your blog via the blog hop and am following. Hope you enjoy the rest of your weekend. Ohh these are so pretty, love how you decorated them! Very cute! I love the bright colors. I can’t believe that free-hand egg! 🙂 You are so talented my friend!! Thanks for sharing at oopsey daisy! Fun idea! Your newest GFC follower from The Creative Corner Hop. You gals knock out the most awesome Easter projects!!! Love these!